For the third time I found myself getting henna in the Morocco Pavilion at Epcot last trip. I can not recommend something more for you or your little ones. I saw three girls ranging in ages from 5-12 getting it done in front of me and loving it. So, first you decide what you want or what you want to spend. The first two times I did a “here is $25 and do something unique” type deal and loved it. This time I sifted through the book and found so many beautiful things it made it hard but I was able to do a sort of hybrid. I showed them a few I liked and also upped the ante to $40 and went with it. It took about 10 minutes and while it was happening I was able to enjoy the music from the new band Ribab Fusion that is only there through January 2, 2016. Once finished with the initial design (which was amazing and perfect) you get to pick which color glitter you want (pink or blue) but who can pick? There is never enough glitter so I went with both and that was my favorite part! 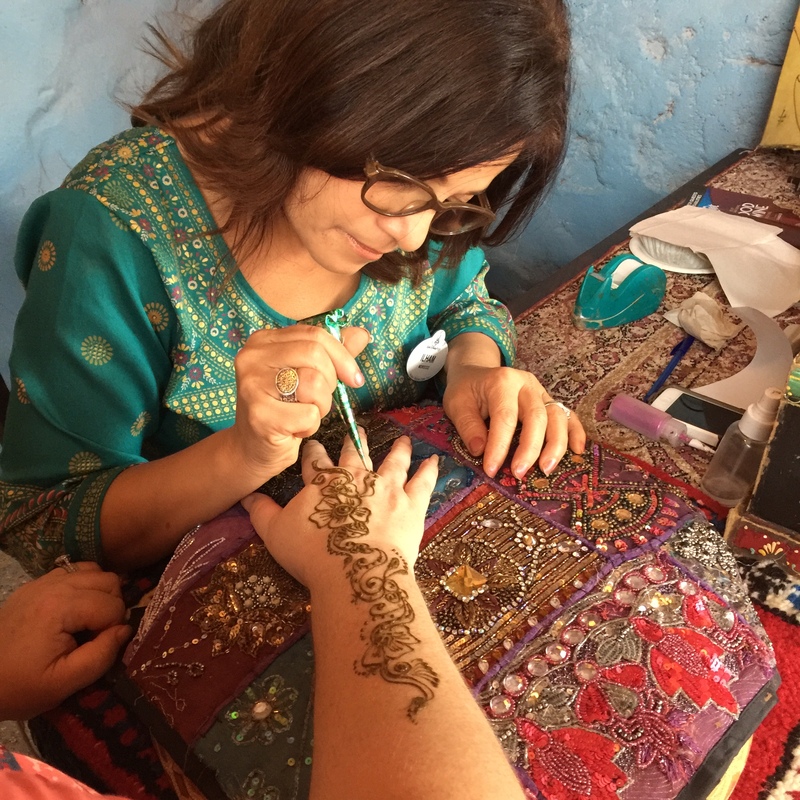 Henna has a long history in many cultures and is something usually done in celebration. Such as a bride before a wedding or a big party and what is more of a celebration than a trip to Disney?? I love it and I think it is a great experience and a good learning time for the kids. 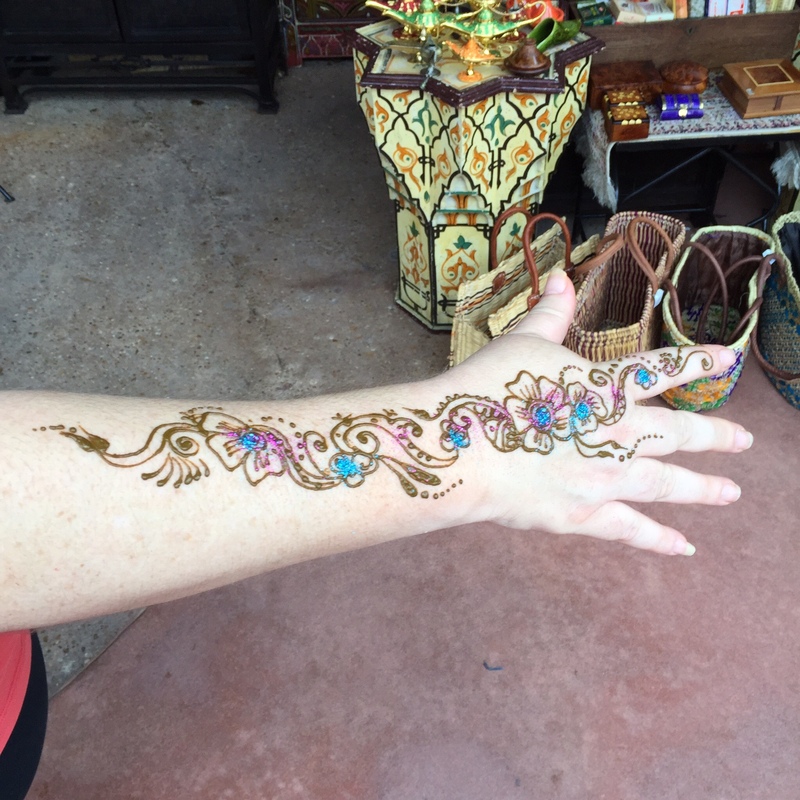 This entry was posted in Disney World and tagged Epcot, Henna, Morocco, Ribab Fusion by Tara. Bookmark the permalink. Very pretty design. I love having henna done myself. They do such a good job and so quick! Considering I am not even good at painting my nails I am in awe of their talents.